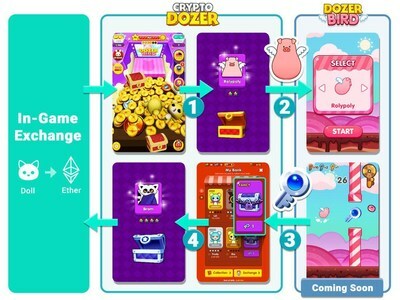 As the new blockchain game, CryptoDozer attracts more users and overtakes CryptoKitties' item transaction record. SEOUL, South Korea, April 17, 2019 /PRNewswire/ -- A new blockchain game, CryptoDozer, developed by PlayDapp, hits record high item transactions, averaging 30,000 weekly, moving ahead of last year's top blockchain game: CryptoKitties. CryptoDozer is a blockchain-powered arcade game with the aim to collect various CryptoDolls, valued from $0.16 to $11,000 in cryptocurrency, by dropping coins. The game has seen thousands of users successfully withdraw ETH since its launch. Even the first of its highest ETH value CryptoDoll – worth 70ETH – has been won by a player in Spain last week. CryptoDozer has seen a significant number of winners, with each big winner having a range of crypto experience. Such as its 30ETH winner – the second highest possible prize – a college student from Vietnam. As well as the 70ETH winner – worth approx. $11,000 at the moment – a real-estate worker in Spain. CryptoDozer is converting users from non-crypto friendly to crypto gamers. Additionally, out of four of the largest winners to date, only one has played Crypto games extensively before playing CryptoDozer. PlayDapp, the team behind the game, has ambitious plans to ensure the sustainable success in the early-stage blockchain gaming space. PlayDapp, a team of 20, with former PC and mobile gaming veterans, aims to build a blockchain-powered, open marketplace for individual game enthusiasts and developers. The team is now in the process of developing more titles after the successful operation of CryptoDozer. The most interesting point of blockchain games lies in their interoperability. The game assets of CryptoDozer are no exception. The startup is currently developing a new title called DozerBird, which will integrate CryptoDozer's characters and key elements. A new player marketplace for trading valuable in-game items will be also supported by DozerBird's launch, projected to be in May 2019. This will allow for smoother and easier gameplay between titles. This integration will create a virtuous circle between different games as well as boost interaction between users. PlayDapp team emphasized that PlayDapp will be the first to run fully interoperable blockchain game mechanics, not just as seasonal events but as native game content, which was implemented and designed from the start of development. Also, they added that they expect this team of experts to take blockchain games to the next level by contributing to and leading the yet-far-to-go blockchain gaming ecosystem.